Posted on February 25, 2015 at 5:11 pm. 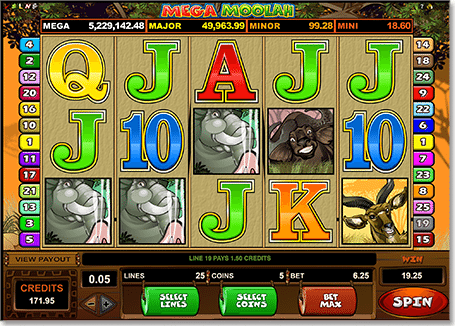 The Mega Moolah online slot is poised to make one lucky punter five million times happier as its progressive jackpot keeps edging towards an all-time high. The top prize on Microgaming’s premier progressive pokie currently stands at a jaw-dropping $5,225,139 Australian dollars, making it far and away the most lucrative real money slot game at our recommended online casinos right now – even surprassing The Dark Knight pokie’s recent $5 million climb. The game features five reels, 25 paylines, and a randomly triggered bonus game with no less than four progressive jackpots on offer. The one you really want is the Mega Jackpot, which starts at a guaranteed $1 million. Mega Moolah is the crown jewel of the Microgaming Progressive Jackpot Network (MPJN), which has paid out well over AUD $460 million in total since 1999 – including a record Mega Jackpot haul of US $9.49 million (AUD $12.03m) in December 2012. The big bucks aren’t limited to desktop casino players on PC and Mac, either, as the Mega Moolah mobile slot has made many an instant millionaire in recent times. One “Gabriel L” famously claimed a GBP ₤3.74 million (AUD $7.35m) world-record mobile jackpot win while betting on his smartphone in September 2013. The Mega Moolah Mega Jackpot is also linked to the much-loved The Dark Knight progressive slot game, as well as Mega Moolah Isis, Mega Moolah Summertime and Mega Moolah Five Reel Drive. Check them out at Royal Vegas Casino – our top-ranked Microgaming pokies site for Australians.